Enter the world of folklore, myth, and magic. Discover binding spells and banishing spells, spells for love, luck, wealth, power, spiritual protection, physical healing, and enhanced fertility drawn from Earth's every corner and spanning 5,000 years of magical history. 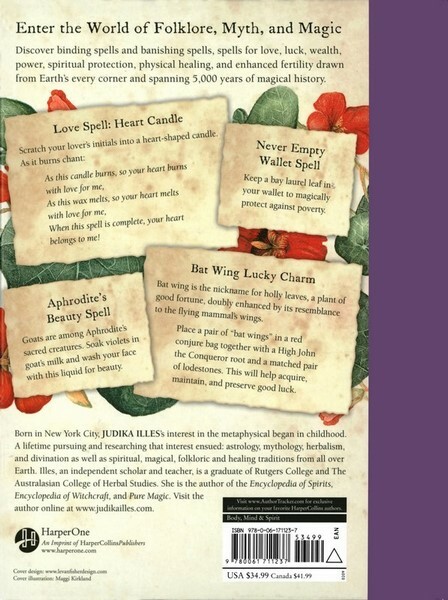 In Encyclopedia Of 5,000 Spells: The Ultimate Reference Book for the Magical Arts, independent scholar, educator and author of several books of folklore, folkways, and mythology Judika Illes enables the reader to enter the world of folklore, myth and magic with binding spells and banishing spells, spells for love, luck, wealth, and power, as well as spells for spiritual protection, physical healing, and enhanced fertility drawn from Earth's every corner and spanning 5,000 years of magical history. Judika Illes is an independent scholar, educator, and author of several books of folklore, folkways, and mythology. Judika is a graduate of Rutgers University and has a certification in therapeutic aromatherapy from the Australasian College of Herbal Studies. Her books include Encyclopedia of 5,000 Spells, Encyclopedia of Spirits, The Element Encyclopedia of Witchcraft, The Weiser Field Guide to Witches, and The Weiser Field Guide to the Paranormal (published under the name Judith Joyce).